I've always liked quiche! Especially the ones with a lot of veggies in it. But here's my beef: it's always so heavy on the palate! The cream in the egg mixture coupled with the butter from the flaky pie crust is yummy, but way too rich. I can't ever eat more than a couple of bites, even though I love the flavor. And then if you do eat more than a couple of bites, you feel gross afterward. But I really wanted to try my hand at making it. I scoured the internet and my cookbooks for an acceptable recipe, but to no avail! A lot of them called for 1/2 or 1 cup of heavy cream, along with butter! So I set out to make my own recipe. I improvised as I went, writing down each step, hoping that it would turn out well in the end! My first thought: I don't want to make a giant pie-sized quiche. I want the egg & veggie part to be the highlight, and have very little crust. The large amount of butter in the crust can be heavy. Thus, I went about reconstructing the quiche! 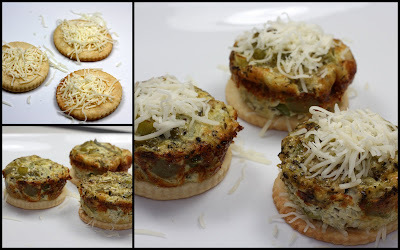 Mine will be mini quiche cups that sit on a small disk of crust! Perfect! I started with the classic pie dough recipe that I use for everything. I used cookie cutters in two different sizes. I matched the larger cutter to the size of the muffin cups, and then grabbed another cutter that was one size smaller. I plan on using the larger one for the bottoms of the quiche cups and the smaller ones as garnish on the side, so that people who prefer more crust, will have it handy. Poke each disk with a fork. Put in a 425 degree oven for 5 minutes, then reduce the heat to 350 and bake for another 5 minutes, or until golden brown. When done, set aside to cool. Next, move on to the filling! I sliced up leeks, green pepper, and artichoke. But you can really use any veggies you like. Saute the veggies in some olive oil, Italian seasoning, and garlic salt until almost all the way cooked. Prepare the quiche mixture, which consists of only a few tablespoons of cream, milk, eggs, seasoning, and the veggies. Coat a non-stick muffin pan with baking spray. Pour 1/4 cup of the egg mixture into each muffin cup. Bake in the 425 degree oven for 15 minutes. While the quiches are in the oven, start on the quiche topping- something that will be light and tangy on the palate! The base of this sauce is plain greek yogurt; the brand I use is called Fage. You can find it at places like Whole Foods and Trader Joe's. It's super creamy, low in fat, and high in nutrition! It's a bit sour if you eat it on its own. It reminds me of a healthier version of sour cream. 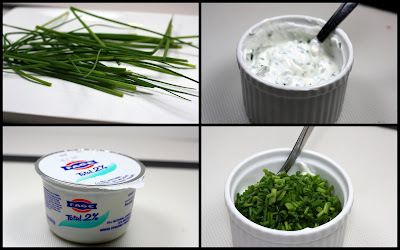 Mix the greek yogurt with garlic salt and chopped chives to create a great topping! It's a lot like tzatziki sauce, with a clean and crisp taste. I often like to serve carrots and chips with this sauce. It's good with everything! Make sure to let the quiche cool for a couple of minutes before trying to get them out of the cups. If you run a butter knife around the edge of each cup, it should come out easily and cleanly. Once the quiche cups are done, you're ready to construct! It's pretty easy, layer in this order: pie crust, cheese, quiche cup, and more cheese on top! After each cup is assembled, pop them back into the 425 degree oven for 5 minutes, or until the cheese on top melts! When they're out of the oven, allow to cool a tiiny bit. Then add a dollop of the chive and yogurt sauce on top! Serve with extra sauce and pie crusts! I was so surprised at how well these turned out! We had them for dinner and they didn't feel heavy at all! They were super yummy! The veggies with the refreshing taste of the greek yogurt sauce were a perfect combination! Even dipping the extra crusts in the sauce was pretty good by itself! Give my non-traditional quiches a try! Use this basic pie dough recipe. Use a cookie cutter that is about the size as the opening of the muffin cups. Reduce temperature to 350 and bake for another 5 minutes, or until golden brown. Saute the veggies and seasoning in olive oil for 5-7 minutes, or until almost fully cooked. Mix ingredients together and ladle 1/4 Cup of the mixture into each muffin cup. Bake at 425 degrees for 15 minutes. Wait 5 minutes for the quiche cups to cool, then run a butter knife around each cup, this should make them pop out pretty easily. Mix well until combined. Chill until you're ready to use. Put cheese (any kind you like, I used an Italian Blend) on the pie crust disks, add a quiche cup, and sprinkle more cheese on top. Pop into a 425 degree oven for 5 minutes, of until the cheese on top melts. Cool for a couple of minutes, add a dollop of the yogurt topping. I haven't ever thought about actually making homemade quiche, but this looks awesome! LOVE the pics, and I agree that lighter is better whenever possible when it comes to quiche. Oh, and looooove Fage yogurt! good work on the photos on this one Judy. Keep up the great lighting! I just found this blog!! So excited to try the quiche! I'm going to make it for my contribution to our family Easter Brunch!